Funny thing about all those Black Friday and Cyber Monday "deals": When there's so much stuff you can't afford not to buy, you end up buying a lot of stuff. And then you have no money. Taco Bell has always been there when you needed to keep yourself alive for cheap, though, and today is no exception. 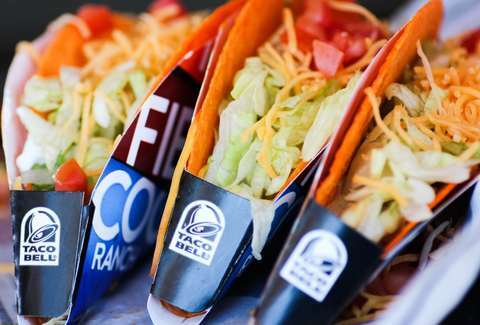 Taco Bell is giving out free Doritos Locos Tacos until Wednesday, November 27 at 2:59am ET, aka tonight at 2:59am. So consider your dinner plans made, and congratulate yourself on your ability to continue feeding yourself. All you have to do is purchase any combo meal or drink online or through the chain's mobile app. Unfortunately, you'll only be able to get one free taco per customer, so you won't be getting a feast for dinner and a second feast for second dinner. This taco came in at No. 4 on our ranking of Taco Bell items, so count your blessings at getting something that is both free and good. Once that deal ends, you can just live off half-off Domino's pizza all this week. Want more free food and food deals? Here's our running list of the best Cyber Monday free food deals and our running list of all the free food you can get all this month. You're welcome.